Bad luck, I am realizing this E.P by the insane Pigs is 14 minutes long. Even worse – my girlfriend is asleep and I am listening to this intense album, titled ‘Gaffe’, as it blasts my ears through the headphone. I am sitting quietly, although all I can think of, with this music, is to get up and break something under the amazing influence of these charging three tracks. What can I say? 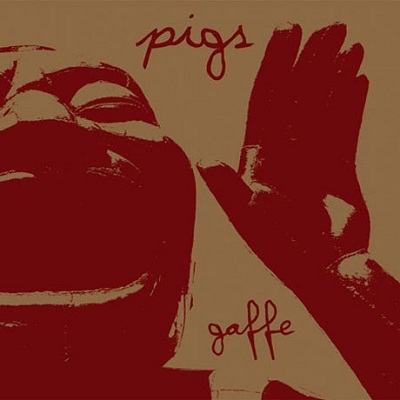 ‘Pigs’ bombs everything with wild guitars, heavy bass, war drums and harsh vocal abuse that never cease to amaze me. ‘Gaffe’ is a beautiful display of power, anger and, well – fun, I think. It’s this combination that stands behind how great this music is, as it seems to push forward even more with each passing track. Yes, it’s an engaging, painful sort of ‘fun’ to listen to this E.P over and over, believe me. Too bad I have to sit quietly in the room while listening to this monster. Maybe tomorrow I will break something.